Looking for something different to the usual jewellery? 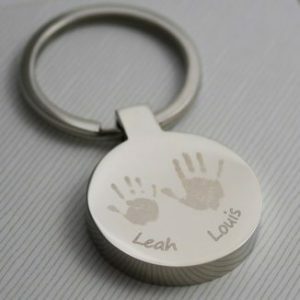 Keyrings can feature your choice of fingerprints, hand prints or foot prints, for up to 6 children. They give a daily reminder of holding our loved ones, making ideal gifts for Dads, Mums and Grandparents too. 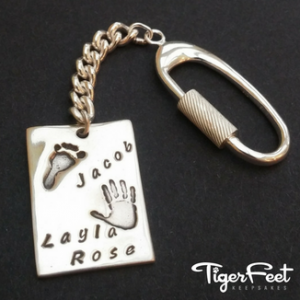 a handmade, fine silver, large keyring charm, attached to a stylish sterling silver chain and oval screw keyring – which can feature fingerprints, handprints or footprints for up to 2 children. 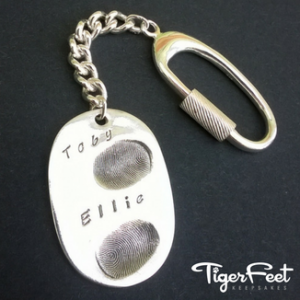 an engraved stainless steel keyring, in a slim dog-tag style or various chunkier shapes – which can feature handprints, footprints and a short message for up to 6 children.